We deliver the service and community commitment of a local, family-owned business backed by the strength of a company that’s built 75,000 incredible outdoor structures since 1980. We offer you the benefit of an international architectural design center that will custom design your project to complement your home, suit your personal tastes and meet your exact needs for functionality. We build decks, sunrooms, screened rooms, screened porches, pool decks, spa decks, gazebos, pergolas, porches, loggias, arbors, privacy screens, planters, benches, ramps, bridges, walkways, docks, garden structures, outdoor kitchens, outdoor rooms, and much more. I’ve worked with a lot of contractors over the years, and John Crews is not only one of the nicest guys I’ve ever met, but he really takes care of his clients and he knows his business. It was a pleasure working with John through the project as he always listened and responded proactively to our concerns. He truly cares about his clients and delivers an incredible product. We love our new deck and have thoroughly enjoyed working with John. Thanks again, John! Archadeck’s design and construction in replacing my existing deck could not have turned out better. The craftsmanship is obvious and the design work enhanced the outdoor space completely. Cleanup was accomplished as appropriate, and I am quite satisfied with the overall experience. When we first considered building a screen porch in 2011 we immediately thought of Archadeck and John Crews because they had done such a good job rebuilding our deck some years earlier. The Archadeck website had several helpful photos and ideas. When we met with John he presented several options and price ranges for the porch, so we were able to customize the porch to be what we wanted. The final result was a very nice porch that we are really enjoying. John and his crew Mike and Tommy, and also the subcontractors, were always friendly and helpful, which made the construction of the porch as pleasant as possible. Archadeck installed the screen in individual custom-made panels, which is not only attractive but also very practical if you ever need to replace part of the screen. They also installed screen beneath the floor boards to keep out insects, which we think is helpful. Two options that we selected – skylights and cedar “arches” – were well worth the extra cost. The screened porch that John Crews designed and built is a wonderful extension to my living space. John’s construction crew and group of subcontractors worked diligently to provide a top quality structure. It was a pleasurable experience from beginning to end. My family, friends, and I will enjoy this outdoor room for years to come. Thank you John and your crew for giving us the perfect addition to our house. Our new screened in porch is more than we ever envisioned, absolute fabulous! What a pleasure it was working with you and your men. Thanks again for our beautiful addition, which by the way is where you will find me most of the day!!! I had to write to tell you how happy I am with my beautiful deck that Archadeck built for me.I couldn’t believe how quickly it was completed-just like you promised. Your crew was professional, polite and always on time. Thank you so much! My experiences with Archadeck were positive from my first call to John Crews through my final payment upon completion of our projects. John and his crew treated my wife and me very professionally and with respect. I was very impressed with the thorough methodology they employ to be sure that they build the project that we were expecting. They were also very flexible. We made a major modification in mid project and John and his crew had no problem incorporating our changes. The workmanship is incomparable. I saw no short cuts from any of Archadeck employees nor from any of the subcontractors that were utilized in the project. Archadeck has a design tool that helps you visualize your project in advance of the first board being placed. John has also selected very good craftsmen to subcontract specialty work such as electricity, painting, roofing, guttering, etc. John and his crews and subcontractors were very responsive to our needs and wants. The value I received for my investment was well spent with Archadeck. 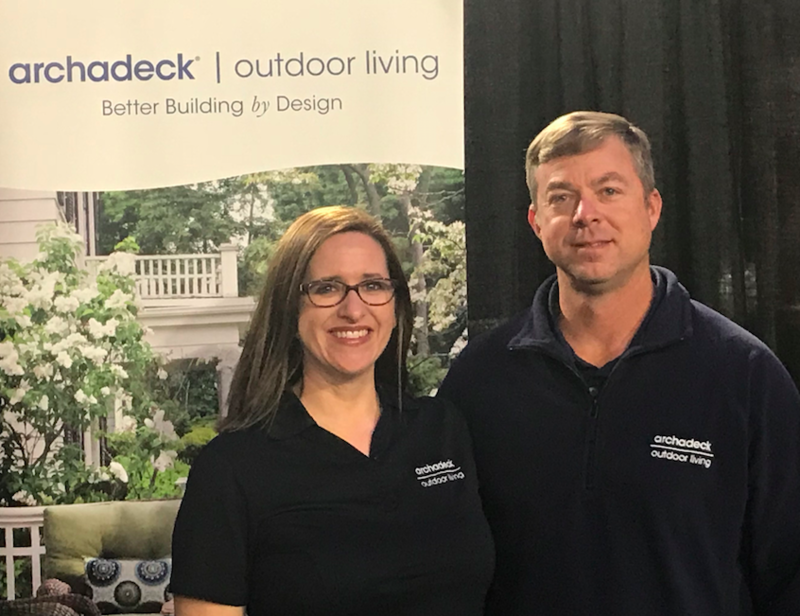 I am very proud of our completed project and I have invited John to bring his potential clients to my home to show what type of work Archadeck performs. Derek, Thank you all for your hard work and building our deck! We love it! Archadeck was very professional and an excellent choice for our outdoor project to replace the porch and expand it with an added deck. They worked with us on options and delivered exactly what we wanted. We would highly recommend them! Thank you Derek! We love our outdoor space.